Posts in the LTE Category at Argus Insights, Inc.
Sprint is Gaining Customers, But Can They Keep Them? A couple weeks ago we examined the effectiveness of Sprint’s ‘Cut Your Bill in Half’ promotion, and now CNET has reported that Sprint “added close to a million customers during its fiscal third quarter,” putting them “just ahead of T-Mobile in terms of total customers.” Sprint has introduced a slew of promotions in an effort to surpass T-Mobile and secure its spot in the top three US carriers. Sprint’s increase in customers came with an increase in delight. 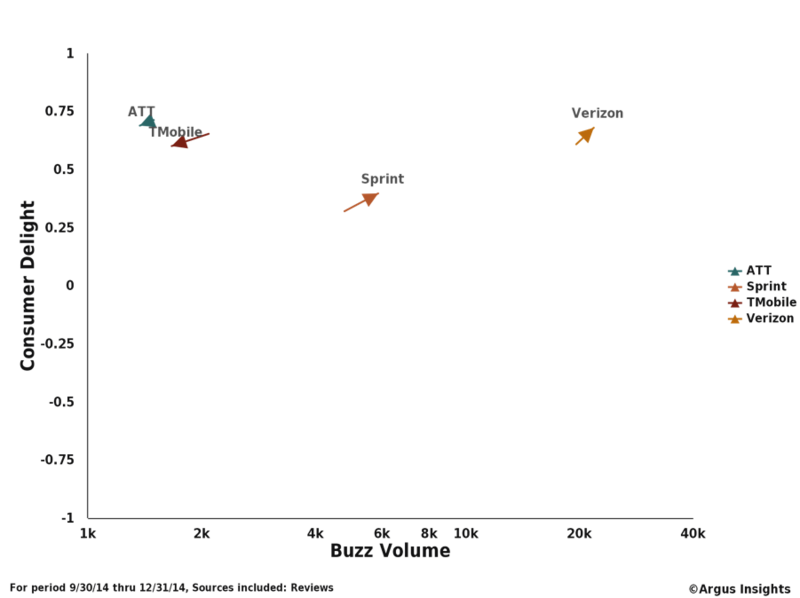 However, despite this internal growth, Sprint consumers are some of the most unhappy smartphone customers. 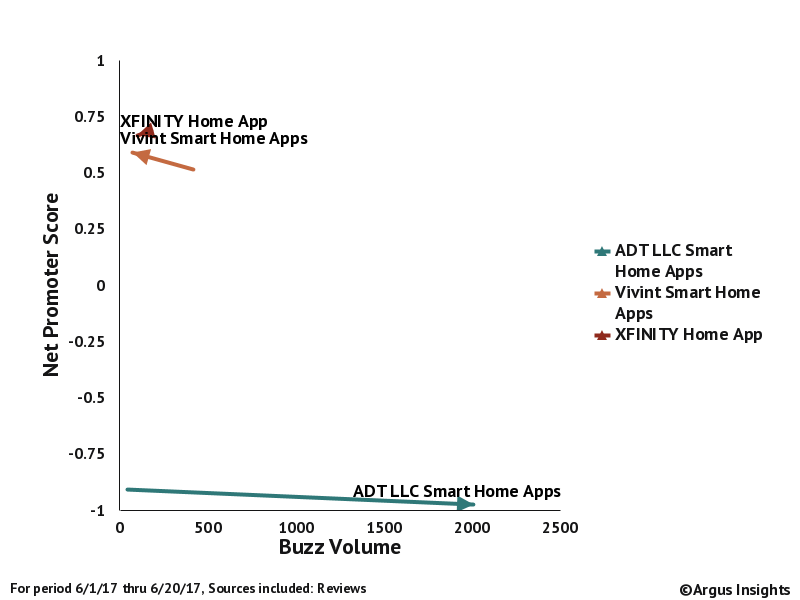 Buzz and delight have both gone up for Sprint as it gained more customers through various promotions, but Sprint’s overall delight scores remain lower than all other US subscribers. Sprint slashed access fees and increased data to attract customers, but Sprint’s users continue to report the problems with the speed, performance, and reliability of their phones. Will these recently acquired customers stay with Sprint if they do not invest in upgrading their network? While Sprint has seen an increase in their personal consumer delight scores, indicating better satisfaction within the company, they are still the least delightful major US carrier. With T-Mobile and other carriers constantly looking for ways to shake up the mobile market, pushing their own promotions like allowing customers to roll over unused data, can Sprint retain their underwhelmed customers with low rates? 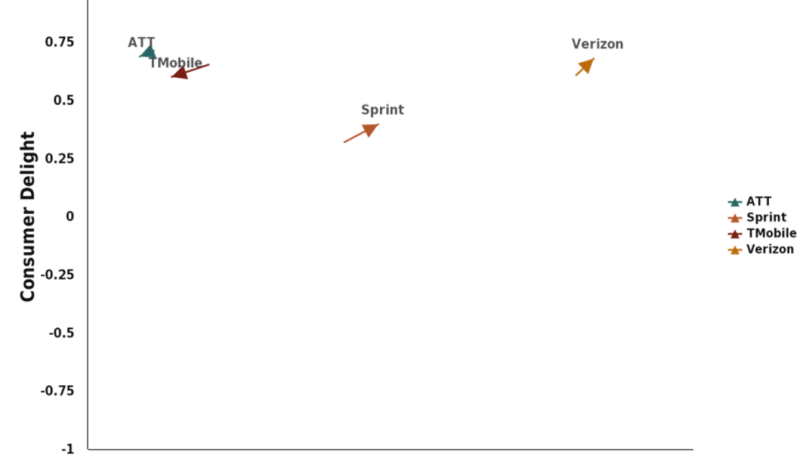 Or will they seek greener pastures with the next another carrier to offer them an appealing promotion? Argus Insights will continue to track the feedback from Sprint’s new consumers to report if they can maintain the momentum they have gained through promotions. For a detailed look at the entire smartphone market, check out our Monthly Consumer Demand Reports (also available for Wearables and Home Automation). Please contact us with any specific questions or to gain access to our data. Carriers Matter: Is Sprint 4G + iPhone 5 > AT&T 3.5G + Verizon 4G + iPhone 4? Today Apple announces the next iPhone, wait, iPhones. Off their traditional one year release cycle but bouyed by the rapid adoption/defection to Verizon by iPhone 4 customers, Apple is expanding their game in the US Market. Question is, will Sprint achieve the gains expected by iPhone exclusivity over the coming months. Our feeling at Argus Insights is yes! Why? Because carriers matter. Below you’ll a chart of the overall smartphone experience with the iPhone 4 represented as a separate measure of market expectations. The iPhone 4 had a surge this past winter as Verizon was able to open it’s doors to iPhone refugees. No changes in hardware, no major OS changes, simple a change in the network the phones had access to and voila, an 80% increase in the reported user experience over the AT&T baseline. Carriers matter, period. 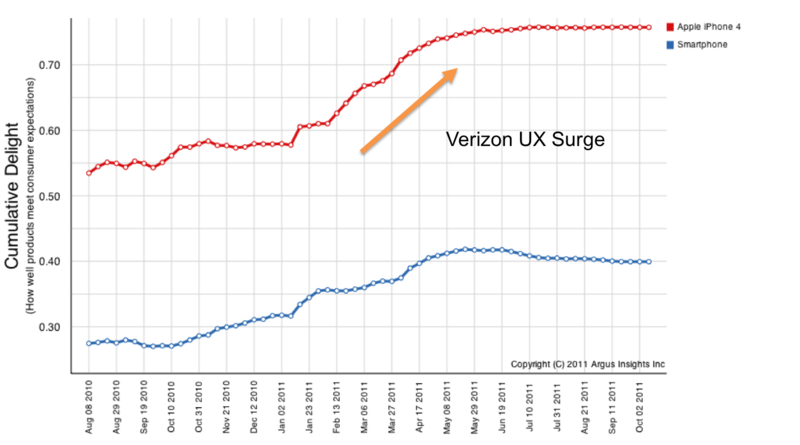 Our graph of the Verizon Surge shows the average Cumulative Delight (on a scale of -1 to 1) for the smartphone market as measured from each product release date. 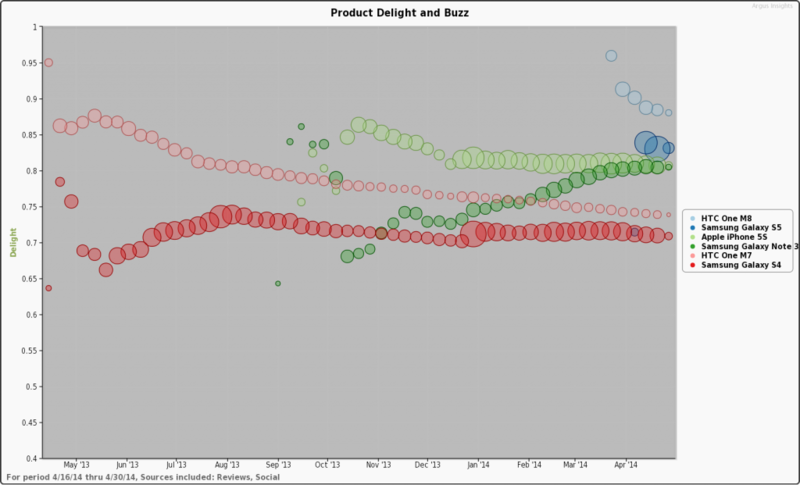 Typically products decline in delight over time as new products are released and disrupt existing user experiences. This didn’t happen with the iPhone 4. 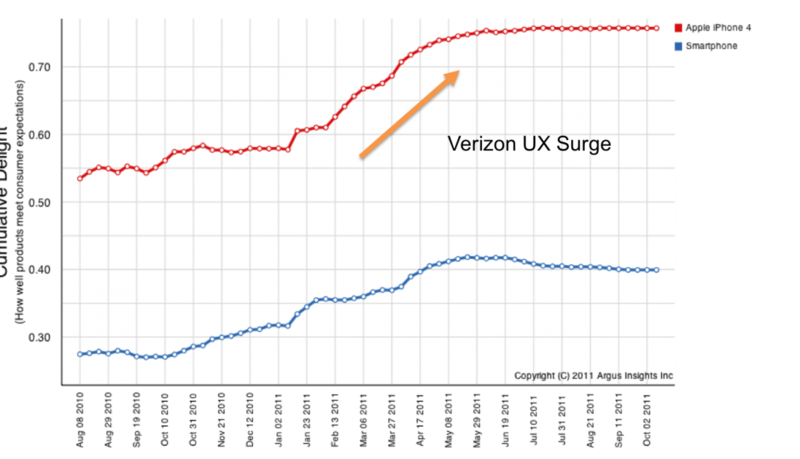 This late in the game surge is due to the opening of Verizon’s network to iPhone 4 customers who were delighted to have a smartphone they could use to make phone calls. pressures from the likes of HTC, larger screen, faster processor, effectively becoming a mini-iPad that can make phone calls (because face it, it’s hard not to laugh when you hold your iPad up to your ear to answer that call from Mom). Larger screens hint towards an even greater focus on content consumption, surfing, gaming, movies, etc. the same trends we are seeing across both Tablet and Smartphones. 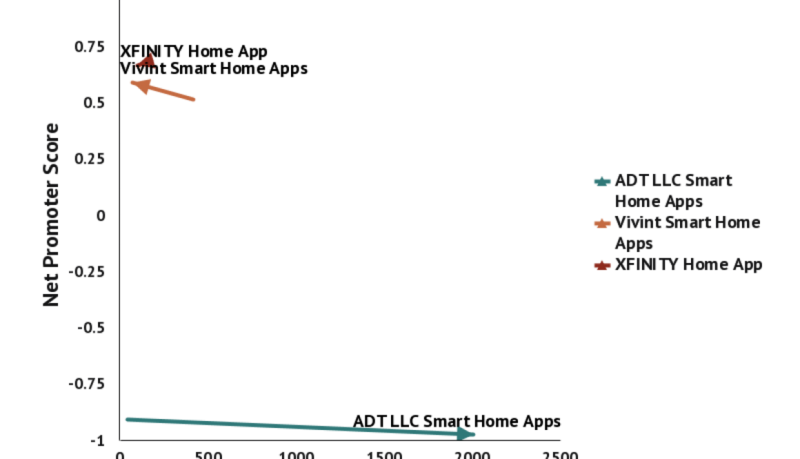 See the graph below to see how the conversations about smartphone reflect usage levels. 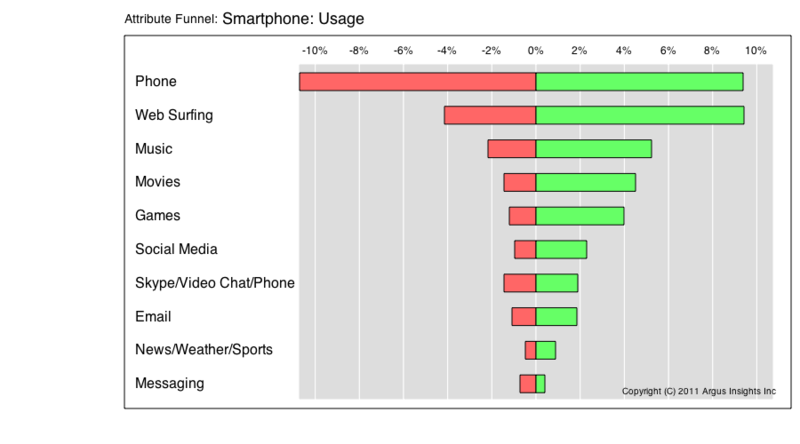 The green bars on the right show the distribution of positive comments across all reviews and the red bars on the right show the negative comments across all reviews. Notice that of the top ten most discussed usage scenarios, the remaining nine almost double that of using the phone as a phone. We spend more time on our phones not talking as we spend talking. This deluge of content requires bandwidth and the US network with the most mature 4G (real 4G, not rebranded 3.5G) is Sprint. This means that Sprint is the best positioned network to help Apple deliver on the promise of the fully turbocharged iPhone 5 experience, especially as they become more reliant on cloud based delivery systems. Amazon’s recent announcement of the new Kindles, especially the Fire, coupled with the ambitious launch of the Amazon Silk browser puts additional pressure on Apple to get the extended parts of their growing content empire dialed in. Sprint could be the right partner to deliver on this promise to the broadest swath of the market. We look forward to watching this story play out over the coming weeks and months. Contact us if you would like more details on the impact of the iPhone 5 on the mobile competitive landscape. You may have heard IDEO founder David Kelley talk about the importance of hiring T-shaped people. These are folks with a depth of expertise in one area, but enough breadth of empathy and skill to work across multiple domains. This organizational design insight is one of the keys to IDEO’s successful creation of multidisciplinary innovation teams that consistently turn out heart-stopping innovation after another. You could make the argument, quite successfully, that it takes teams of T-shaped people to create T-Shaped experiences. What’s a T-shaped experience? It’s one in which the ecosystem creates a coherent and delightful flow through the arc of the experience for the user, but requires the coordination of several disparate ecosystem partners. The most notable experience of late is the device-content-service ecosystem that Apple has created around the iPhone. Apple has chained several players around the anchor of their device to architect one of the most defensive consumer positions in the market today. What’s interesting is how others are leveraging this same play using their own T-shaped anchor. Amazon surprised the world when they went into the hardware business and launched the Kindle. Amazon leveraged their T shape with strong content and retail experience to extend into a dedicated and unprecedented reading experience. It’s the opposite tact of Apple, but just as effective in creating a powerful experience that Apple has had to compete with by changing their developer agreements when no other strategies proved successful. Barnes and Noble followed suit when they created the Nook. Both companies realized that people were not consuming less content (books, movies, music), but they were consuming it differently (no more CDs when you have Pandora, no reason to buy and carry 600+ pages of The Deathly Hallows when it can fit with the rest of your in-hand library). Rather than being left behind, Barnes and Noble chose to lead. Borders, unfortunately, realized this too late and didn’t follow their customers out of the store and into their homes fast enough. experience by bringing hardware into their direct control. Google now could integrate vertically and horizontally just as well as Apple or Amazon. It also means that Motorola gave up in competing in a market place where their I-shaped experiences (hardware, hardware, and hardware) were not cutting the mustard with consumers. HP, in the face of difficult competition in a growing population of T-shaped experiences, decided to exit the market entirely rather than explore content parters to grow the right wings on their I. Now there are rumors of Amazon releasing a tablet, which will further extend their reach into the lives of their consumers and grow their wingspan at the same time. Question is, what is the next frontier? We think it’s bandwidth—mobile broadband. Why? Because our thirst for content on these portable gateways into our connected lives makes access to bandwidth the weakest link in the experience. 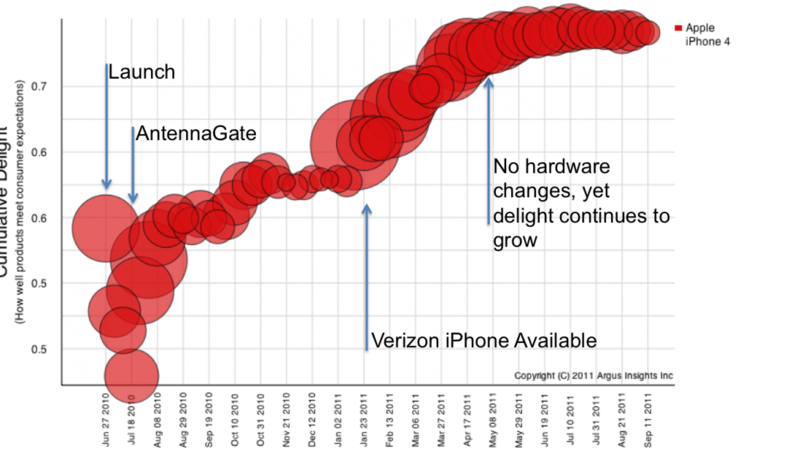 Witness in the graph below the rise in Delight by iPhone 4 customers when they could actually make a phone call on the Verizon network. AT&T was that awkward friend who came along for the road trip because it was their car. Once Apple proved they were cool enough to hang uptown, they were able to trade up for a friend with a beamer. Now the iPhone 4 is a complete experience. It’s a smartphone that can actually make phone calls! The world is moving rapidly to T-shaped experiences, because they are more defensible. Consumers enjoy the high-quality user experiences within these maturing ecosystems, but it brings with it significant disruption to the consumer electronics ecosystem—the impact of which we have yet to fully experience.